3-3 is a hand very similar to 2-2. Basic Strategy entails that these hands be played exactly the same way: split when the dealer is showing 2 through 7, otherwise, hit. The average return per situation is also very similar. I will review the numbers here for those of you that are curious. 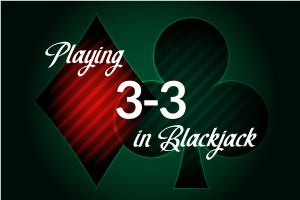 If you choose to hit 3-3, it is treated as a 6. The return per dollar when hitting a 6 is negative regardless of what the dealer has exposed. For the dealer's 2 through 7, this return ranges from -$0.01 to -$0.15. For 8 through A, the return is -$0.22 to -$0.34. Now let's look at the effect of splitting. If the dealer has a 2 through 7, there is a slightly positive overall return ranging from -$0.05 to +$0.20. For 8 through A, the return is -$0.23 to -$0.55 per dollar invested. According to this data, it is clear that you should only split this hand if the dealer is showing 2 through 7. Don't be tempted to split the hand just because you can, the effects will be disastrous on your bankroll.